HartyHarHar: Hey! That's Emily Hart on the poster! 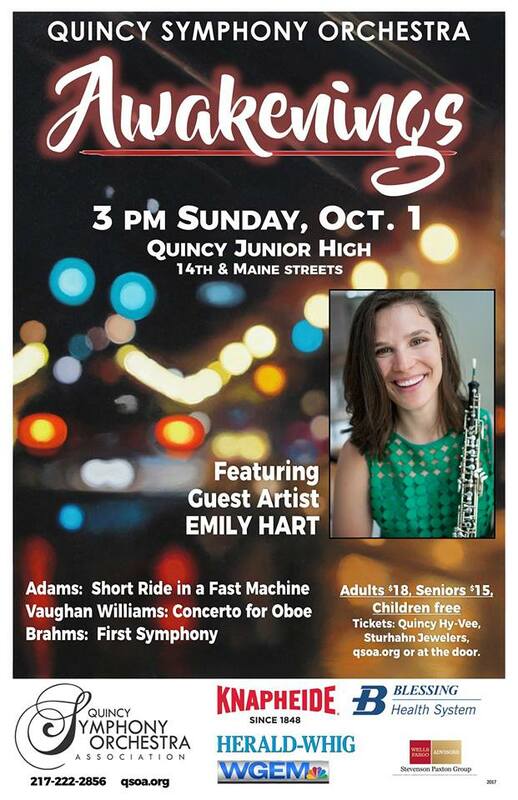 HAPPINESS IS LOOKING at a Quincy Symphony Orchestra poster and seeing your daughter's smiling face. For weeks we've had it hanging in the store and I can't believe how many people say, "Hey! That's Emily Hart on the poster! How is she doing?" That's usually followed by a discussion on the blood DNA sample I had to provide to prove she's actually related, but I digress. I am proud of Emily. She has worked very hard and has attained great success in a very short time as instructor of oboe at Western Illinois University. She is the Guest Artist at Sunday's Morrison Theater Awakenings Concert. 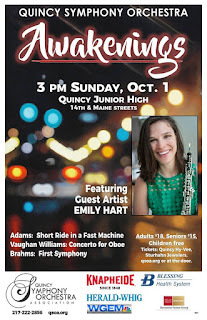 If you have never heard the oboe, I encourage you to come and hear it with a great orchestra and music. It's a high and lonesome sound - it sort of drifts through the room, and it's very moving. We are in the midst of school band rental season at Second String Music. It makes me think of how Emily got started, and how the music teachers influenced her. I remember vividly going to Lana Anderson's house near Berrian School on Eighth Street, then to Marianne Peters, and to Larry Finley for piano. Lana and Marianne both play in the QSO and I'm sure they are bursting with pride when they see Emily and hear her play. Emily also got tremendous instruction and opportunity at Quincy Public Schools, and I'm forever grateful for people like Kathy Dooley. Both the public and Catholic schools have massively successful music programs and have pushed countless students to great heights. Yup. That's our Emily on the poster. She's all grown up, teaching and playing music for a living. Fortunately it's the opposite of her old man, who never grew up but actually does teach and play music for a living. What a strange world we live in! We can't wait for Sunday afternoon and I hope you can join us for a great concert.